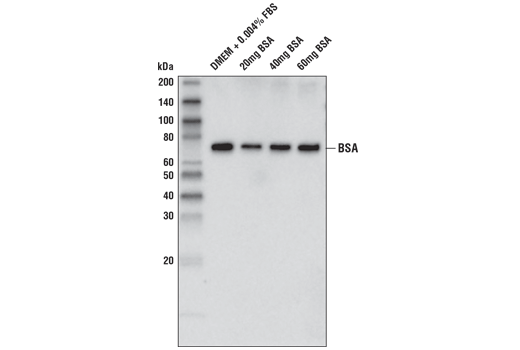 Western blot analysis of the indicated amounts of DMEM/FBS and BSA using BSA (D4L9G) Mouse mAb. 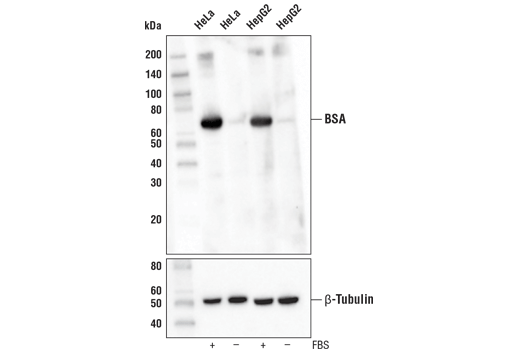 Western blot analysis of extracts from HeLa and HepG2 cell lines, grown in media with 5% FBS and havested without PBS wash (+ FBS) or harvested with 3 PBS washes (- FBS), using BSA (D4L9G) Mouse mAb (upper) and β-Tubulin (D2N5G) Rabbit mAb #15115 (lower). BSA (D4L9G) Mouse mAb recognizes total bovine albumin protein. The antibody does not detect human albumin. Note: For best results, avoid reagents that contain BSA.